The third day of EuroBasket Women Final Round is the semi-final competition with France playing the Czech Republic while Russia take on the Czech Republic. Russia is through to the final after beating the Czech Republic (85-53) with four players in double digits: Elena Danilochkina, Liudmila Sapova, Ilona Korstin and Maria Stepanova. 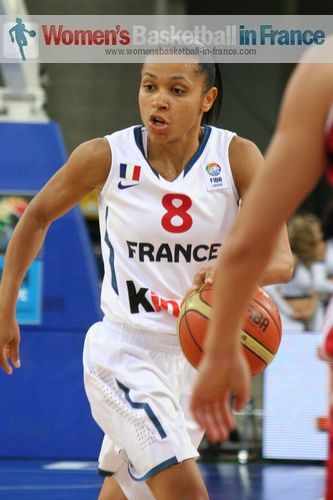 Despite Emilie Gomis' 24 points France were beaten in overtime by Turkey (68-62). Montenegro played Lithuania for a possible fifth place finish earlier in the day in the classification round and won (68-59). If they can beat Croatia the following day, they get the last AQT spot. You can read the stories of interest from the EuroBasket Women games by selecting the link below. Russia are regular EurBasket Women finalists. Once again when the going got tough the Russians knew how to come out on top. Elena Danilochkina and Liudmila Sapova led the way with 18 and 16 points each and combined for a total of 8 three-pointers. The veteran pair Ilona Korstin and Maria Stepanova both scored 11 points. The Czech Republic put a lot of energy to try and get back in the game early in the third quarter but the ball refused to drop. Then Lubor Blazek threw the towel away and let his bench players have a run. However the Russians showed no mercy and won by 32 points. No time was wasted in the first EuroBasket Women semi-final match by the Russians with Olga Arteshina scoring from the top of the arc with the very first attack. But Eva Vitecková responded almost immediately for the Czech Republic. Then it was all Russia with 5 points from Elena Danilochkina and a couple from Ilona Korstin that forced Lubor Blažek from the Czech Republic to call a time-out after 6:24 with his team trailing (9-2). A trey by Katerina Elhotova gave the Czech Republic fans something to celebrate. But Russia dominated with Danilochkina leading the way as her side maintained their advantage (20-11) with just seven minutes played. The Czech Republic changed tactics and went on the offensive. Vitecková hit a three-ball before Jana Veselá calmly strolled down the court and hit a big rainbow two-pointer directly in line with the basket. Yet Russia survived the storm to edge the first quarter (22-18). Danilochkina (right) continued her festival from beyond the arc with a shot from way down-town to open the scoring with a big three. But that was the end of the fireworks. Defense became the order of the day for the rest of the quarter with Russia holding on to a double digit lead (34-24). 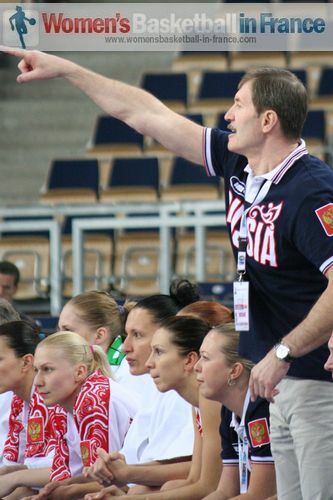 The Russian coach was not satisfied and called a time-out with two minutes left. 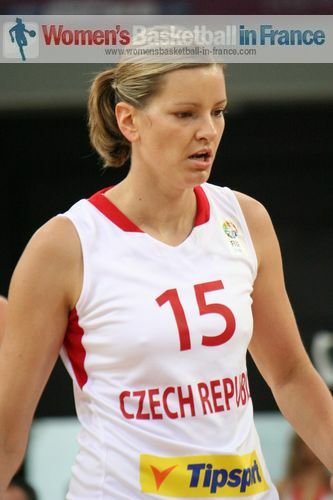 The Czech Republic scored first through former Bourges Basket player Ilona Burgrová. But once again Danilochkina was left open for a split second and hit her fourth trey of the match. Russia went into the locker room leading (39-26) with their captain scoring the last points of the first half. The Czech Republic did not go to the locker room during the break but went to one corner of the arena and stayed in the stands. The two teams went straight on the attack in the second half with both teams scoring alternatively. However a trey by Vitecková got the whole Czech bench on their feet. 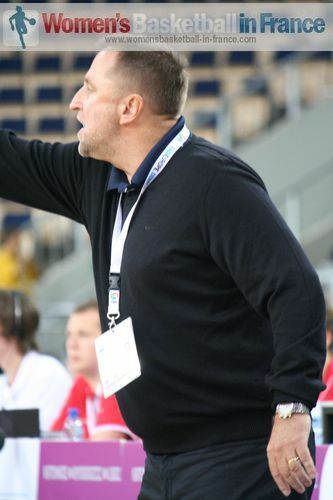 The Russian coach was not happy and with 6:54 left to play called his first time-out of the quarter despite his team leading by 10 points (43-33). The Czech Republic were playing hard and fast but the ball just refused to drop for them. Whereas Russia kept on scoring from counter attacks to move 19 points clear with 90 seconds remaining in the quarter. 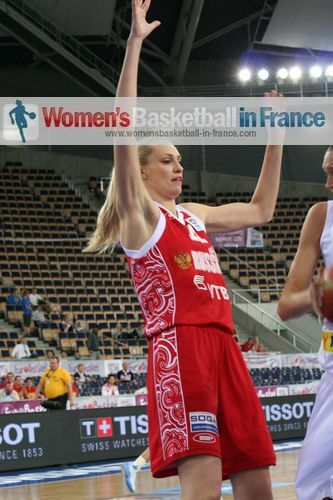 Despite a fast break two-point buzzer score by Veselá, Russia went into the final quarter (61-43) in front. It was one-way traffic the rest of the way with Liudmila Sapova hitting three-pointer after three-pointer as Russia's advantage grew to 29 points. The Czech players did not find their way back into the game. Russia ran out winners (85-53) and qualify for their sixth consecutive EuroBasket Women final. France may have opened the game with a 7-2 run. But Turkey’s 12-0 run afterwards set the tone for the rest of the match. France spent their time chasing after the score. Turkey hit the big shots when required and also had some incredible luck. As they say if you do not shoot the ball you will never know if the ball goes in. France did not shoot the ball well but as they managed to force overtime the game was still open. In the end Turkey took care of the ball with just 9 turnovers. Nevin Kristen Nevlin who we spoke with in our video interview after the quarter-final hit 23 points while Nevriye Yilmaz had 17 points and 11 rebounds. Birsel Vardarli won the point guard battle with 14 points and 5 assists. For France Miss GO, Emilie Gomis had 24 points and Edwige Lawson-Wade 12. Sandrine Gruda never recovered from her early knock. Turkey who will be hosting the 2014 FIBA World Championship for Women continue to be the comeback queens of the 2011 edition of EuroBasket Women. Nevin Kristen Nevlin won the tip-off for Turkey. After using up the 24-second clock Nevriye Yilmaz managed to lift a shot from the corner to score. 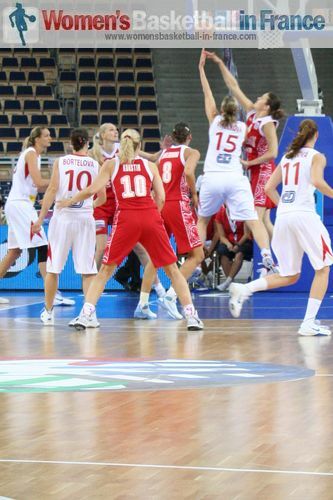 However Florence Lepron (right), in the starting line-up for the first time in this edition of EuroBasket Women, was allowed to waltz her way into the paint to score. France were on a run and raced off to a (7-2) lead with Emilie Gomis and Lepron doing all the scoring. Ceyhun Yildizoglu, the Turkish head coach, called a time-out for his team to take control with a 10-0 run with Nevlin doing most of the damage (12-7). It was then the turn of Pierre Vincent to call a time-out while at the same time Sandrine Gruda was receiving treatment. Nevlin continued her festival before Nwal-Endéne Miyem scored for France. A trey by Edwige Lawson-Wade had the French supporters making noise. But when Tugba Palazoglu scored on a fast break the Turkish fans were louder. The match was getting intense on the court but also in the stands the noise competition from the two sets of supporters sitting side by side grew. With 3.3 seconds to play Vincent called a second time-out. However Lawson-Wade failed to inbound the ball with a five-second violation, so Turkey won the first quarter (16-15). The two teams continued to hit each other on the run with three-pointers flying in from Gomis for France and Birsel Vardarli for Turkey. Turkey continued to be aggressive and stretched their lead (29-22) with five minutes into the second quarter. Turkey pressed with Vardarli running the show. She made a nice weighted pass to Isil Alben who hit the three-ball for Turkey to move into double digits (36-26) with 2:29 left in the first half. France were unable to put a break on Vardarli, who somehow got to the baseline to score on the buzzer for Turkey to lead (38-31) with Nelvin leading the way with 14 points. France started the second half very aggressively which resulted in a Turkish time-out with just two minutes played. By then France had reduced the deficit to 3 points (35-38) after a Jennifer Digbeu And1. Gomis' three-ball brought France closer. But a mid-court turnover allowed Yilmaz (right) to score for Turkey (42-38). A mid-court unsportsmanlike foul by Saziye Ivegin allowed France to come 2 points closer with Gomis hitting the free throws. France turned the ball over again and Nevlin was left free to score (44-40). Vincent decided with three minutes to go he needed a time-out. Turkey maintained the momentum after the time-out and hit France on the fast break with a big three by Ivegin. A fast break two-pointer by Wade was all France managed as they went into the final quarter trailing (42-49). The fourth quarter turned into a classic encounter as all the main players stepped up. Lawson-Wade was doing her best to bring France back offensively with 8 fourth-quarter points to reduce the deficit to a single point (52-53). France finally regained the lead (54-53) with 3:10 to play as Gomis (left) hit a pair of free throws. Yet the lead did not last long as Gruda was called for a foul on Yimez. However the three-pointer of the evening came from Ivegin just as the 24-second buzzer was to sound. Then France replied with back to back three-pointers before Yardarli somehow tied the game once more (60-60) with 44 seconds to play. Turkey had the chance to win the game in regulation time but Vardarli missed both free-throws with 7 seconds to go. Also Céline Dumerc failed with her lay-up to put her side in front. With both teams at the foul limit any foul would send a player to the free-throw line. Suspense and tension continued. The start was scrappy as both teams turned the ball over. However Turkey scored first as Nevlin split a pair and Gomis followed it up to score for France. Both sides started to miss the unmissable until Alben hit a trey with 1.49 to play to give Turkey the lead (64-62). The rest is history. France could not hit a single shot and their defense of EuroBasket Women champions has come to an end as Turkey ran out winners (68-62). Both teams appeared a little nervous at the start of the game and failed to get into their stride. Lithuania led (7-4) midway through the first quarter after Egle Sulciute collected an offensive rebound to score. Montenegro picked up the pace and went in front after Anna De Forge concluded a fast break (10-9) with two minutes left to play in the first quarter. Finally the game picked up and Rima Valentiene (left) connected with a big three for Lithuania. However Montenegro found their strength back of their previous games with Jelena Dubljevic scoring for her side to edge the first quarter (14-12). Ausra Bimbaite lit up the second quarter with her three-point shooting as Lithuania regained the lead. However Montenegro battled back and the two teams went into the locker room tied (29-29). After the break Lithuania were on fire from as they hit every shot from the field to go 5 points clear (44-39). When they finally missed a shot, they still extended their advantage with a Gintare Petronyte put-back. Miodrag Baletic from Montenegro called for a time-out with his team trailing (39-46). His words worked some magic as his players scored the next 4 points. Yet in their hurry they allowed Petronyte to score once more. The game became more physical as the intensity increased. Lithuania gained the upper hand going into the final quarter with a trey by Valentiene and a couple of free throws by Sandra Linkeviciene (53-45). However in the last quarter Montenegro fired out of all cylinders and went on a 23-6 run while Lithuania fell apart and lost (59-68).